East Asians aren’t known for their prowess in athletics. Hence, the handful of medals that our Japanese neighbors had won in the years past hold much value. I admire Japanese track & field athletes the most because of the raw emotion that they exude. This exemplifies the very essence of sport. Dai Tamesue 為末大 is one such athlete. As a talented 22-year old, Tamesue crashed out of the heats in the 2000 Sydney Olympic Games. He clipped the penultimate hurdle in the grueling 400m low hurdles. Nevertheless, he managed to finish the race in 1:01.81, much slower than his then personal best of 48.47s. Tamesue bounced back in sterling fashion the next year at the 2001 Edmonton World Championships. He ran a gutsy race, storming to the lead early on. As the hurdlers came into the final bend, the diminutive Japanese man was the surprise leader. However the American-born Dominican Felix Sanchez and the Italian Fabrizio Mori overtook Tamesue in the final 80m. After the disappointment in Sydney, Tamesue shed tears of joy at his bronze medal. The Japanese shaved off more than half-a-second from his erstwhile personal best, stopping the clock at 47.89s. In the next couple of years, Tamesue failed to replicate his winning form. He didn’t go beyond the semi-finals of the 2003 Paris World Championships and the 2004 Athens Olympics. At the 2005 Helsinki World Championships, the then 28-year old Tamesue (48.10s) again struck bronze with much drama. As he shook off the effects of lactic acid after his characteristically gutsy all-out racing style, he overtook the rapidly decelerating Kerron Clement (48.18s). Four long years after his Edmonton triumph, Tamesue once again reached the podium of a major championship. By the time the Japan hosted its own edition of the World Championships in 2007, Tamesue was but a shadow of his old self. Approaching 30-years old, the veteran could only manage to place 6th (49.67s) in his heat. A bronze medal in the World Championships might not count for much in terms of relative athletics greatness. But can greatness be holistically defined by medals alone? Derek Redmond became immortalized as he dramatically limped to the finish line assisted by his dad. Tamesue, albeit in a far lesser dramatic scale, is worthy of his own Celebrate Humanity moment. Some athletes grumble at winning less than gold. If some people say that you don’t win silver, you lose the gold, what more can you say for a bronze medal? But for Tamesue, his two bronze medals exemplify the hopes of an entire nation. Tamesue, by the way he sunk to the ground in disbelief and raised his arms in triumph afterwards, is every inch the winner. In the elite world stage, the sprinting events are dominated by Americans, Jamaicans and the occasional European and African athlete. Historically, Asians have lagged behind in these explosive, fast-paced disciplines. The most recent individual Men’s sprinting medal came at the 2003 Paris World Championships, when the fleet-footed Shingo Suetsugo (末續 慎吾) finished 3rd in the 200m dash. 3 years earlier at the Sydney Olympics, Susantika Jayasinghe சுசந்திக ஜெயசிங்க்ஹி got 3rd place in the same event (elevated to silver after Marion Jones was stripped of her gold). Jayasinghe also finished within the top 3 in the 200m Dash in the 2007 Osaka World Championships. No Asian man has gone below the magical 10-second barrier in the century dash. The Japanese troika of Koji Ito 伊東 浩司 (10.00s), Nobuharo Asahara (朝原 宣治) (10.02s) and Suetsugo (10.03s ) were the closest. The current Asian record holder, the Jamaican-born Qatari, Samuel Francis (9.99s) is an exception because, well, he’s a naturalized Qatari! In the low hurdles, Dai Tamesue (為末大) won bronze medals in the 2001 and 2005 World Championships. Then, of course, there’s Liu Xiang (刘翔). 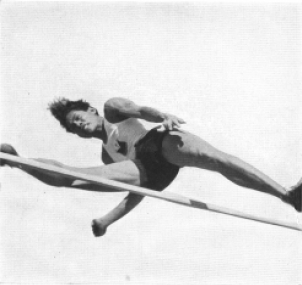 Liu had won everything in the 110m High Hurdles – Olympics, World Championships and World Indoor Championships. For an Asian, qualifying to the finals of an Olympic or World Championship sprinting event is an achievement in itself, in light of the puny number of medals won by sprinters from the world’s most populous continent. With these facts in mind, it’s remarkable how the Japanese Men’s 4x100m relay team (Naoki Tsukahara (塚原 直貴), Suetsugo, Shinji Takahira 高平 慎士 and Asahara) finished 3rd (38.15s) at the 2008 Beijing Olympics. Japan has always been a consistent qualifier to the 400m relay finals (4th – 2004, 6th – 2000, 6th – 1992, 5th – 1932); it was about time the Japanese won something big on the Olympic athletics stage. Despite the absence of the American and British quartets, a podium finish at the Olympics is a stellar feat in itself. I just love how the Japanese celebrated (reminds me of my team’s 3rd place finish back in UAAP 69! We were ecstatic!) It’s reminiscent of the raw emotion found in those sports-oriented Japanese anime (like Hajime no Ippo and Slam Dunk. I love sports anime!). Men were openly crying, unafraid to show their true emotions. This would have to be my favorite moment in the Beijing Olympics, topping even Usain Bolt’s devastating three-event romp. In a sense, small victories like these give us Asians hope. If the Japanese can do it, surely (with enough reforms and political will), Filipinos can distinguish themselves at the elite level.